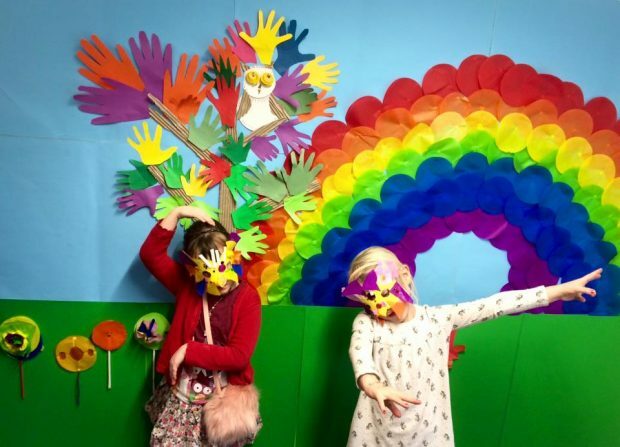 Family storywalks, combining exercise with book-related activities, have been running in Kirklees Libraries for over nine years. In this time, they’ve developed from simple picture hunts during a walk, to a tool we’ve used to build relationships with communities, deliver high-quality events at low cost and engage with hard to reach groups. A storywalk is an opportunity to bring books out of the library, to promote reading and libraries in an alternative environment, to bring stories to life and allow families to combine reading with physical activity. Storywalks give children the opportunity to develop literacy skills while playing and ensure the whole family partakes in fun, healthy outdoor exercise. 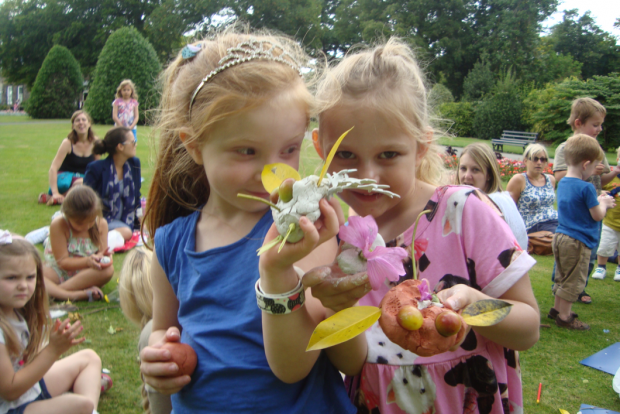 Storywalks have two basic formats, picture trails and nature hunts. 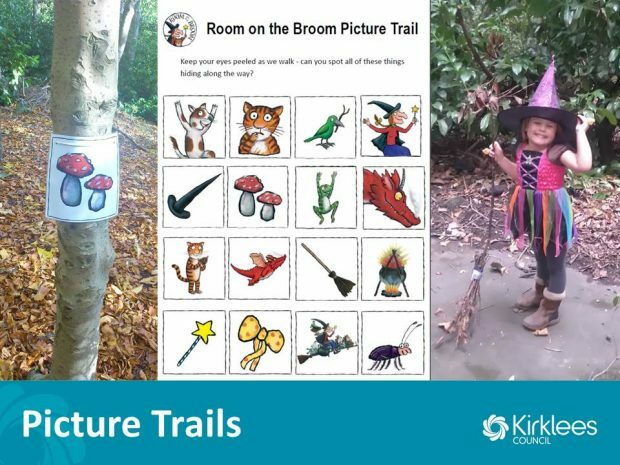 Picture trails involve a treasure hunt themed around a children’s picture book. The event usually starts with reading the book and then children look for characters or elements from the book that have been hidden around the outdoor space. The whole event could take place in a park, or the pictures could be along the route between the library and another community venue. We usually add a craft element, sometimes using items found in the natural environment, for example the broom in our Room on the Broom Halloween picture trail. 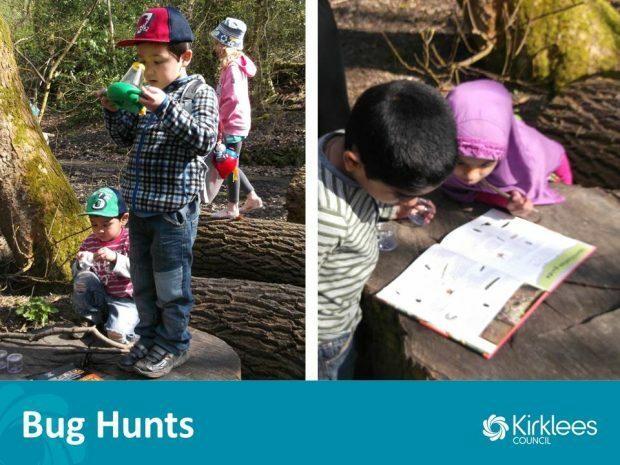 Nature hunts are an innovative way to engage children with non-fiction resources. They involve learning about habitats and wildlife by exploring local outdoor spaces as a family, discovering where to find wildlife and view it up close. Then we use junior non-fiction resources to find out more about the wildlife discovered. To bring books to life and get families reading. By bringing books outdoors and pairing them with physical activity, storywalks inspire reluctant readers and help awaken a love of books and reading. A lovely way to spend a morning. Combining parks with books is a genius idea. Well done Kirklees Libraries! Would like this every school holiday. To give families the opportunity to learn together. Family learning has a positive impact on a child’s development and attainment. Evidence shows that family learning has important wider benefits to both children and parents, impacting on confidence, self-esteem, motivation to learn, parenting skills and practices and health and well-being. First shared experience with my family like this. We’ll definitely do it again! To promote health and wellbeing. Our storywalks programme was initially developed in response to the increased threat of childhood obesity and designed to specifically appeal to families. Storywalks encourage activity amongst families, whilst contributing to increased mental wellbeing and lessening the dependence on sedentary behaviour. Thank you for a wonderful time. Great outdoor activities for children. Nice and kind, helpful volunteers. I’m still smiling! We can’t wait to come meet you next time. Storywalks bring communities together and promote a shared sense of place. Bringing local families together to explore and create in a local community location helps form a sense of community, improves socialisation integration, and promotes ownership and belonging of community spaces. Using local volunteers to support the programme enhances these outcomes whilst empowering communities to do more for themselves. Storywalks engage hard to reach and target families. We have created bespoke storywalks for hard to reach families. For example, we worked in partnership with a community teacher supporting a local school in special measures. Children from Early Years and KS1 were identified as needing help with literacy, language and ‘knowledge and understanding of the world’. We took the whole family, including siblings, on a story walk based around ‘Bog Babies’, a picture book about the importance of wildlife being left in their own habitats. During the walk, we explored the park and collected natural materials to make our own Bog Babies. We found a spot in the park that we felt would be a nice habitat for our bog baby family and left them to live there. Although all of the families lived and attended school in the immediate vicinity of the park, none of them used the space or had visited of their own accord. As well as focussing on improving literacy, by walking the families through the park, we helped them develop a sense of belonging and shared ownership of the local community space. 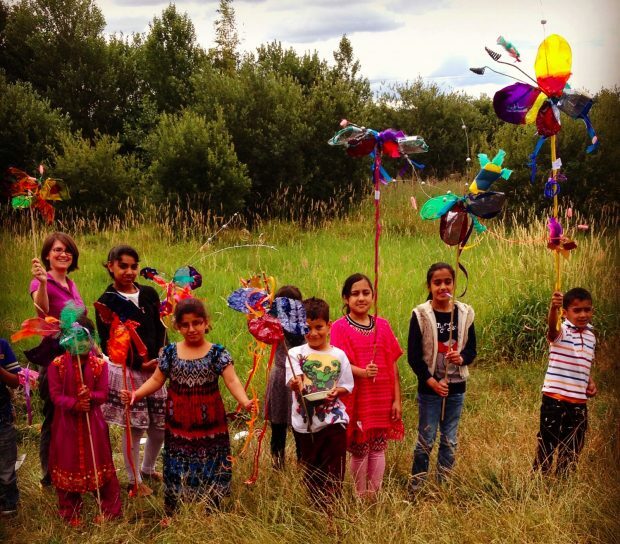 We worked in partnership with a children’s centre, targeting a community segregated by class. The children’s centre is located on a council estate that falls in the bottom 10% for deprivation in the UK; our library is just a 17 minute walk away yet its postcode is in the top 20%. Library and children’s centre staff joined together to lead a series of walks through the summer holidays from one venue to the other, alternating the starting point and encouraging groups to access both services. We were able to build up a regular group composed from both sections of the community. Some participants continued to use both services after the summer walks programme. 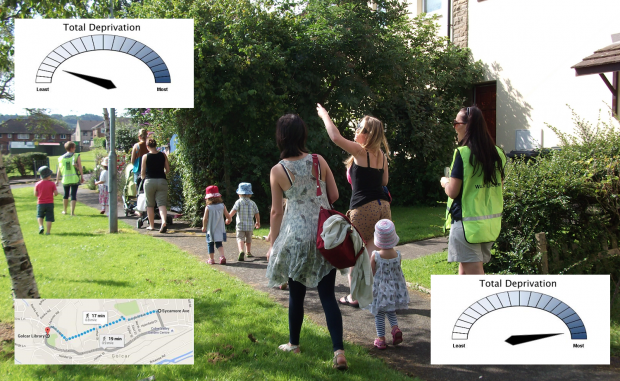 They’re popular: over 1500 young people and adults have participated in a Kirklees storywalk since April 2015. As well as bringing established borrowers out into the fresh air, storywalks are an opportunity to bring books out of the library and promote reading and libraries in a non-traditional environment. Walks in local parks have gathered new participants along the way, enriching their afternoon out with literacy and creating new library borrowers. By organising walks that start at a partner venue and end at the library, we have been able to physically deliver new customers through the door. The focus for the Storywalks Working party this spring has been recruiting and training volunteer walk leaders so that we can maintain and increase the number of walks taking place across Kirklees despite our reduced staff capacity. We have worked in partnership with Kirklees Physical Activity Development Team to deliver Walking for Health training, adapted for family storywalks. In March, we trained nine new walk leaders and worked with them to deliver six Magical Creatures storywalks in the Easter holidays, reaching 147 participants. Now that these volunteers have shadowed walks, they are ready to deliver our half-term dinosaur walks and summer bug hunts independently, adapting the walks to meet the needs of their communities and locality. We will continue to use storywalks to attract new library users, offering healthy, educational and fun activities for children and their families into the future. 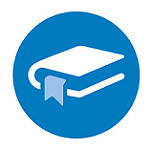 To keep up to date with activities in Kirklees libraries, follow them on twitter or browse their website. And if you decide to run your own storywalks, or do something similar, tell us about it! UPDATE: Good to see that this project has been nominated for the 2017 CILIP Libraries Change Lives Award. Watch their short film here.